published in the late 1840’s. of the firm’s two warehouses. Another version of this ad. quality not stated, at $2.37 a ream. of nearly one hundred years ago. 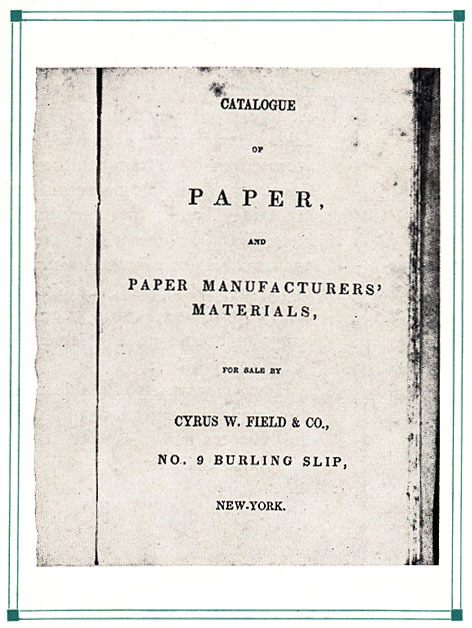 CYRUS W. FIELD’S fame resulting from his great achievement in laying the Atlantic cable has somewhat obscured the fact that he was a successful paper merchant who built up a profitable business in paper and paper-mill supplies. It was accomplished by initiative, hard work, and a perseverance which characterized all his undertakings. 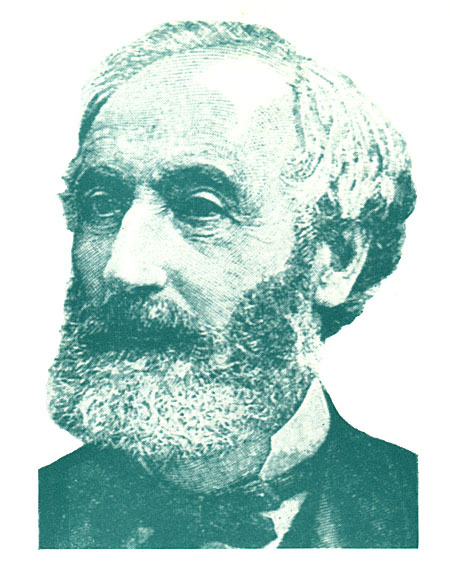 Cyrus West Field was born November 30, 1819, at Stockbridge, Massachusetts. He attended the local school, but his determination to enter business came to him early in life, depriving him of much in the way of higher learning, and of the benefit of a college education. On April 29, 1835, when but fifteen years of age, he set out for New York City to enter upon his business career. When he left home, his capital consisted of eight dollars which his father had given him. He obtained employment in the drygoods house of A. T. Stewart and Company (now John Wanamaker), then located on Broadway between Murray and Warren Streets. His first job was as an errand-boy and he later rose to a clerkship. His first year’s salary was $50, the second year it was increased to $100, and the third year it amounted to $300. 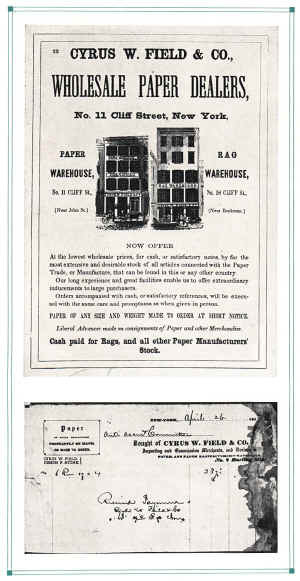 After his three years in the employ of A. T. Stewart and Company, he returned to Stockbridge and began a career in the paper industry. 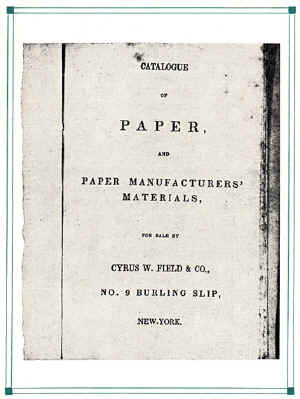 He became a bookkeeper for his brother Matthew D. Field, who was a partner in a paper mill at Lee, Massachusetts. Later this mill became the property of the Smith Paper Company wherein ground wood was first used in the manufacture of newsprint. While in the employ of his brother’s paper mill, his salary was $250 a year with board. He became a successful paper salesman and made trips to Boston, Philadelphia, Washington, and New York. His likable personality won for him many friends in the trade, which was to stand him in good stead later. At the age of twenty-one, he decided to go into the paper business as a manufacturer. 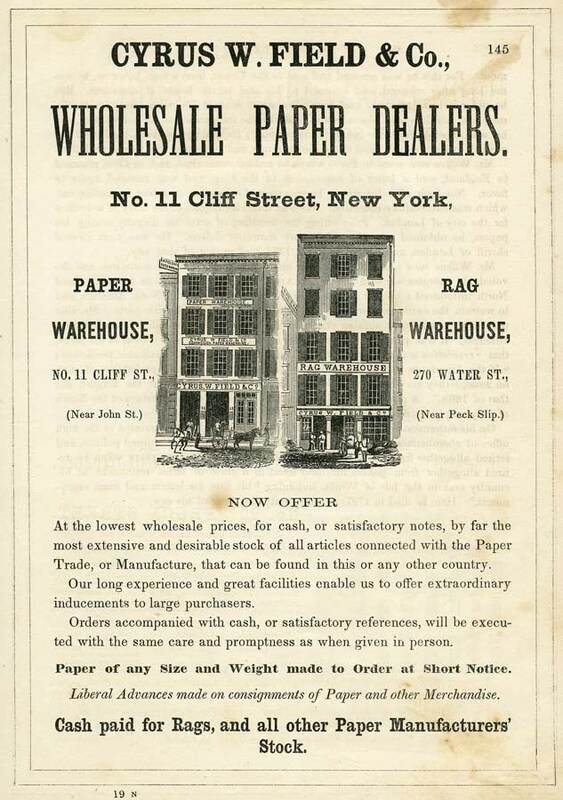 He bought an interest in a small paper mill at Westfield, Massachusetts, after which he accepted an offer from E. Root & Company, wholesale paper dealers in Maiden Lane, New York City. 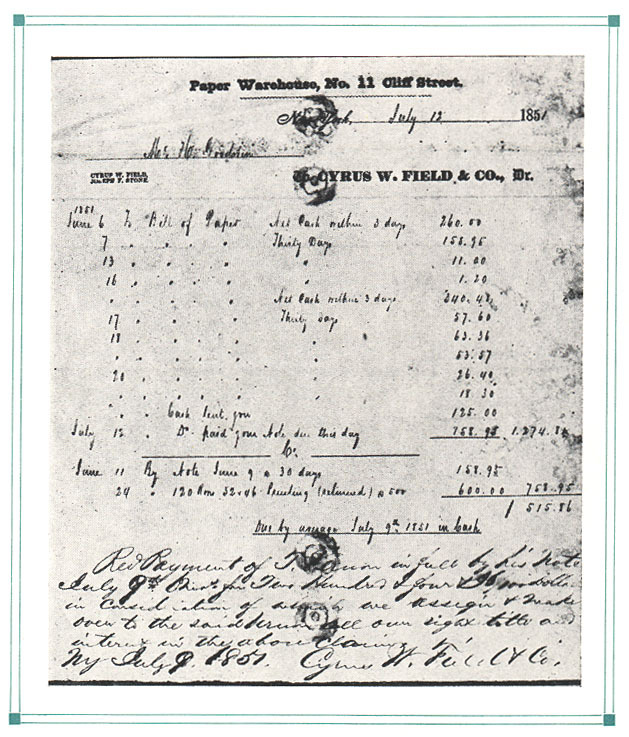 Here, Field became a junior partner and used his acquaintance with the trade in Philadelphia, Baltimore, Washington, and Boston in an attempt to bolster up and rebuild a declining business. However, owing to the effects of the financial depression of 1837, the business failed in April, 1841, with large liabilities. In some unaccountable manner, the burden of the debts fell upon young Cyrus, though he was not the principal of the firm. He made a settlement with the creditors and released himself sufficiently to wind up the business so as to start one of his own. 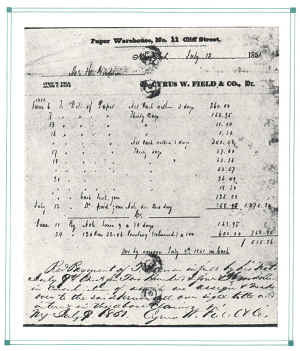 In 1842 he established the partnership of Cyrus W. Field & Company. The “and company” was his brother-in-law, Joseph F. Stone. By 1853, when thirty-three years old, Field had built up a successful business and was worth over a quarter of a million dollars. Although the arrangements with the creditors of E. Root & Company had been in the nature of a compromise, he looked up the old debt records, computed the unpaid portion with interest at seven per cent and paid each creditor in full. There was no legal obligation to do this. Wishing to retire from the paper business, Field left $100,000 with the junior partner with the understanding that he was not to be asked to devote any time to it. He was now a rich man, free to give time to his hobbies and blessed with a peaceful home life. But he was too young a man to retire, and the most active and trying part of his life was to follow. As far apart as two of his enterprises, the paper business and the Atlantic telegraph, may seem, yet they are closely related as means of communication. The click of the telegraph instrument required paper to record the message and to make further transmission of it possible. The cable conveyed the thought, and so that it would not vanish in thin air, paper provided the medium to make the transmitted thought a matter of record for all time. What is related here is only one phase of a useful life which ran the gamut of everything from being called a deluded fool to acclamation as the most business, outstanding figure since Columbus. Adverse criticism was not without some effect upon his honest nature. After a life of public service and generous deeds, Field died in 1892, a somewhat saddened and disillusioned man, but an outstanding example of a fine type of upright and courageous American citizen.